Enmesh yourself in nature and luxurious ambiance for an amazing vacation. 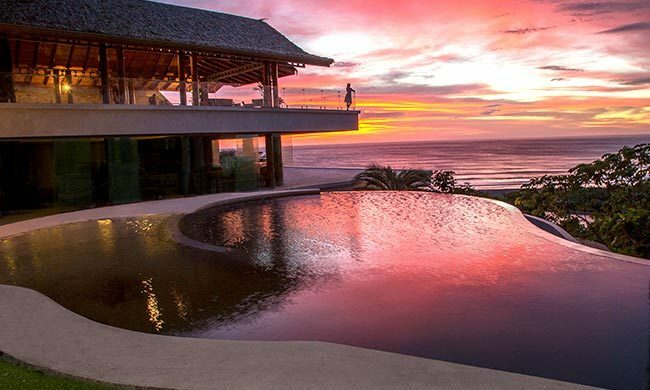 Lagarta Lodge is an elegant boutique hotel situated beside two rivers, expansive sandy beaches, and lush woods along the North Pacific coast of Costa Rica. The property maintains its own private nature reserve with magnificent mangrove trees. These allow you to enmesh yourself in nature and the luxurious ambiance of the resort for the amazing vacation. This means it’s perfect for couples and families which want to get away from the grind of everyday life and submerge themselves in the peace and quiet of nature. Hotel Lagarta Lodge is 4.5-hour drive (or a 30-minute flight) from San José; a 10-minute drive from Nosara’s airstrip or a 2.45-hour drive (or 20-minute flight) from Liberia’s International Airport. The hotel offers a free shuttle service to and from Nosara (and also to nearby beaches). Among its accommodations, the property offers 26 guest rooms, all of which combine the beauty of nature with modern comfort. There are two pools and an adult-only Jacuzzi you can enjoy, as well as a restaurant, nearby beaches, and amazing flora and fauna. The reserve has plentiful of trees, birds, and monkeys to keep you discovering new sounds and sights. The on-site restaurant and spa provide you with delicious food and relaxing time, all while you enjoy fantastic views of the ocean, jungle, and rivers. Nearby you’ll find marvelous beaches. The closest one is Pelada Beach, located only 10 – 15 minutes walking. The farthest beach is San Juanillo, which is 18 km away and requires a 40-minute drive. If surfing is your thing, you will find ideal conditions at the Playa Guiones, and adventure is guaranteed at the spectacular canopy rope course. Lagarta Lodge prides itself of being a sustainable and socially responsible hotel, and these pillars are central to their mission. The hotel is located in Nosara, Guanacaste. This area has been designated as one of the world’s five ‘Blue Zones’ where people live the longest and happiest lives. Every room is filled with thoughtful details. One of its coolest features is a tablet, where you can view hotel information and tours. The hotel has its own private art gallery, which feature art pieces from the Malekus, one of the local indigenous communities in Guanacaste. Lagarta Lodge has its own biological reserve, and guests are welcome to take a guided tour and explore the area.